The world's largest indoor theme park features a host of rides and attractions to create an unforgettable experience for every member of the family. The Park offers more than 17 Ferrari-inspired rides and attractions, including a diverse array of rides for adults and children, a wide variety of Italian delicacies, and unique shopping experiences.Ferrari World Abu Dhabi's iconic sleek red roof, inspired by the classic double curve side profile of the Ferrari GT body, spans 200,000 SQM, carrying the largest Ferrari logo ever created.The enclosed indoor area accessible to the public is 86,000 SQM - large enough to fit seven football fields "head to toe". Ferrari World Abu Dhabi is world's first Ferrari branded theme park in the world. A ticket from itickets.ae to the park guarantees memorable fun like no other on the different attractions including. Buckle up and get ready for a high adrenaline ride on the world's fastest roller coaster for a thrill is like no other as you get blown away by it's mind boggling turns and twists at the speed of light. Prepare to spin on the high speed rotating tire as you collide with fellow riders. The tire can be shared by up to 5 people making it extremely suitable for family and friends. We all enjoy the world of fantasy. Nello, a mischievous Ferrari driver knows this and dares to explore the world no Ferrari has gone before. It's a literally a rough, thrilling ride as you dive into oceans, fly over cliffs and venture into ice caves as a simulator technology teases your senses by adjusting temperature, light, moisture, and the movement. Ride with a Super Star! Well, it doesn't always happen. Get aboard the cinematic motion-based simulator and ride alongside a virtual F1 pro for a thrilling ride along the streets of Maranello. Dreams do come true! Riding in a Ferrari is something not many get to experience. You get to drive around Yas Island in a Ferrari California, and to crown the experience, you receive a lesson into how to drive the car from a Ferrari expert. By the way, you can share this experience with friends or family as the Ferrari has a space of up to two passengers in the back seat. You think you know the Ferrari so well? You put your knowledge to test in an interactive game show with incredible prizes to be won if you prove to be super Ferrari smart or better still, get crowned the fast lane champion. You also get the chance to race friends in a Ferrari F430 Spider on the circuit based on real GT racecourses. Buckle up for a frenzied ride on the Karting Academy's 290 - meter long track inspired by the iconic Yas Marina circuit. Challenge your friends and family on the tracks all the way to the end. You also get to test your racing skills on the virtual Yas Marina circuit with a state of the art simulator. The ultimate goal is to top the best lap times as you race a variety of Ferraris solo or with a group. The Turbo track is one of a kind experience as you ride up in a vertical climb and then an epic zero gravity fall. Definitely not everyone's kind of fun. A multi-sensory simulator soars you over the Italian landscape, over the mountains and villages; cities and vineyards of the home to the most beautiful cars. The racing schools for kids (Junior GT, Junior Grand Prix, Khalil's Car Wash and Junior Training Camp) are dedicated to providing kids with first-hand knowledge from highly trained instructors on various activities such as racing a Ferrari, problem-solving and interactive games for toddlers. It's a privilege for your kid and an inspiring moment for the parent. Having enjoyed the rides and experienced the thrill at Ferrari World, you definitely want to refuel. You can enjoy an extensive range of cuisines and refreshments from the park's exquisite joints including. 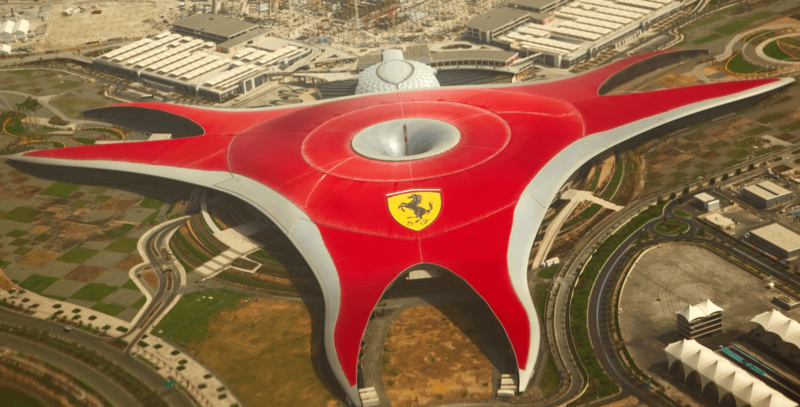 Yas Island is Ferrari world's main attraction feature of the man-made, a top leisure and entertainment destination in UAE hosting exciting attractions, racing events, concerts, luxury hotels and so much more. Copyright ©2014 - 2019 Dubai Visa Center. All Rights Reserved.